Full disclosure: since my resolution to watch all the Oscar best picture nominations I have decided I won't be reviewing Mad Max Fury Road. I tried to watch it but within the first 30 minutes I knew it wasn't going to be my kind of film. On to the current post. Read on to find out my thoughts on sci-fi adventure movie, The Martian. 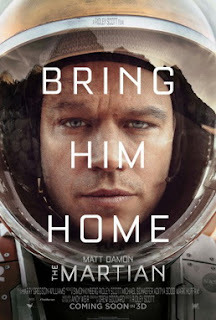 Astronaut Mark Watney (Matt Damon) is missing, presumed dead during a manned mission to Mars. What his crew mates don't realise is that he has been saved from certain death by his own blood clotting to seal the tear in his suit (ok, you've got to suspend disbelief quite a bit for this one). As Mark tries to figure out a way to survive until the next mission to the planet in several years, he records his experiences via webcam. Meanwhile, the NASA bods figure out that someone is moving down on the planet and start to find a means by which to communicate with the stranded astronaut and eventually bring him home. I really enjoyed this film. It is a well-told adventure story with an excellent cast and a script (adapted from the book by Andy Weir by Drew Goddard)) which is by turns humorous and tense. It is a story which is well paced and exciting. The visuals are also amazing and one gets a feel for the vastness of Mars as Mark makes it his solitary home. I found this to be a really gripping film with a number of successes and failures during Mark's stay on the red planet leading the audience to ride each wave of emotions as Mark does; hope, excitement, despair, and fear. The Martian is blessed with an amazing cast featuring actors such as Chiwetel Ejiofor, Sean Bean, Jessica Chastain and Kristen Wiig (to name but a few) who bring life to their supporting roles. I suspect this is not the sort of film which should win best picture, though it is a solid and entertaining one nevertheless.